Do You Have to File an Income Tax Return? 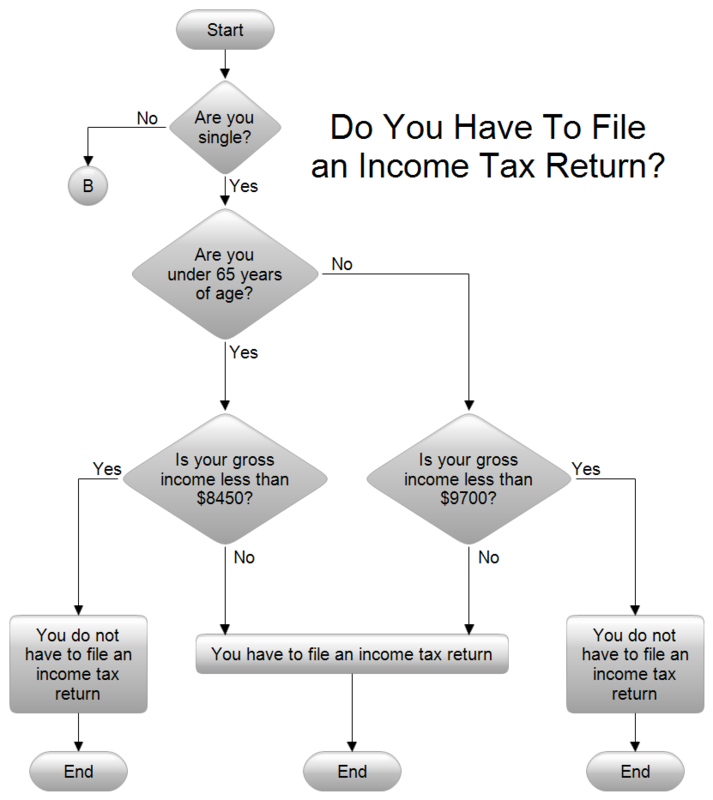 Description This flowchart allows a single person to determine if he or she needs to file an income tax return. It uses a circle to reference another chart. You can use either a circle or an off page connector to break from one chart and enter another. This chart is only good for the tax year 2007. Drawing Instructions First download the free trial version of RFFlow. It will allow you to open any chart and make modifications. Once RFFlow is installed, you can open the above chart in RFFlow by clicking on file_income_tax_flowchart.flo. From there you can zoom in, edit, and print this sample chart. It is often easier to modify an existing chart than to draw it from scratch. To draw this chart without downloading it, run RFFlow and click on the More Shapes button. Scroll to the Flowcharting folder and click the plus sign to open it. Click the Colored With Reflections stencil and then click the Add Stencil button. Then right-click on the name of the stencil on the left of the RFFlow window and choose Properties. In the Line and Color tab, fill the shape with a linear gradient fill going from dark gray (159,159,159) to light gray (223,223,223).